More than 26,000 people from 49 U.S. states and 95 countries around the world attended NBAA14 at the Orange County Convention Center in Orlando, Florida, that included 1,100 exhibitors and 100 aircraft on static display. Lee Bowes, Duncan Aviation Regional Manager, officially kicked off NBAA14 with a beautiful rendition of The National Anthem. 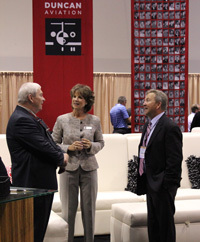 During NBAA, we offered a comfortable place to sit and the opportunity to talk to our most valuable assets: our people. Because tt is our people and their relationships that allow us to rise above the rest. Over the last three days, hundreds of aviation professionals, operators, enthusiasts and even students came to visit us at our booth and hundreds more went to static and got a personal look and tour of this Embraer Legacy 600 that Duncan Aviation completely refurbished both inside and out, performed a 96-month inspection and installed Wi-Fi for Embraer Executive Jet’s PreFlown division. At time-lapse video can be viewed here: http://www.duncanaviation.aero/videos/embraer_refurbishment/index.php. 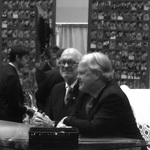 As always, we had fun at NBAA. We hope you did too. 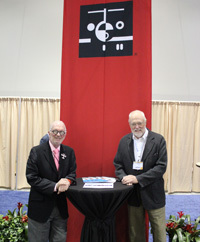 Have a look at our NBAA photo album below. If you stopped by and talked to us this year, "Thank You!" 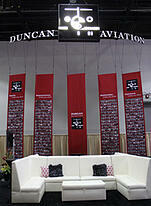 Please take a moment and share with us your favorite Duncan Aviation experience and relationship. During the first two days of the 2014 National Business Aviation Association (NBAA) Meeting and Convention in Orlando, Florida, Duncan Aviation has been recognized separately by three OEMs as a top dealer. 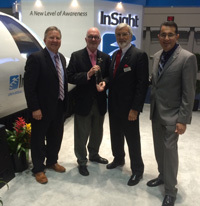 During an in-booth reception on Wednesday, Universal Avionics awarded Duncan Aviation the 2014 Top Dealer in North America. This is the third consecutive year Duncan Aviation has received this honor. This award represents the outstanding performance of only one North American dealer out of several hundred in its Authorized Dealer network. Universal Avionics President and Chairman Joachim "Ted" Naimer and CEO Paul DeHerrera presented the award to Duncan Aviation’s Chairman Emeritus Robert Duncan and John Slieter, Duncan Aviation Vice President of Sales. Also on Wednesday, Duncan Aviation’s Provo, Utah, facility was recognized by Bombardier as the top authorized service facility in North America for its superior support of Bombardier customers. Duncan Aviation's Aaron Hilkemann, Chairman and CEO Todd Duncan and Robert Duncan, accepted the award from Stan Younger, Bombardier Business Aircraft Vice President, Service Centers and Chris Milligan, Director, Authorized Service Facilities for Bombardier. 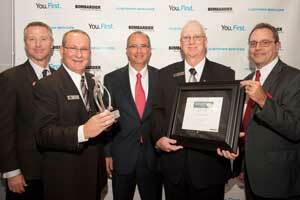 This is the fourth year in a row that a Duncan Aviation facility has received this award. In previous years, Duncan Aviation’s full service facilities in Battle Creek, Michigan, and Lincoln, Nebraska, have been recognized. Duncan Aviation received recognition Tuesday afternoon from TrueNorth Avionics as one of the company’s Top Tier Dealers for 2014, representing TrueNorth’s Simphone product line. 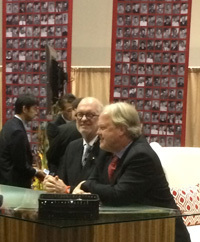 John Slieter accepted the award from TrueNorth’s CEO Mark van Berkel. More than 30 Duncan Aviation representatives are attending NBAA this year, representing several Duncan Aviation services, including airframe and engine services, paint and interior modifications, avionics and parts support and aircraft sales and acquisitions. 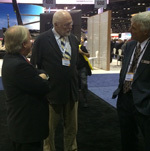 Stop by the Duncan Aviation NBAA booth #208 to congratulate the team. 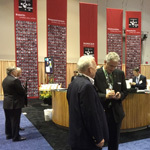 It is opening day of the 2014 National Business Aviation Association (NBAA) Meeting and Convention in Orlando, Florida, and the excitement is palpable among the 1,000 show exhibitors. In Duncan Aviation’s booth (#208) hundreds of business jet owners and operators and NBAA attendees have already stopped by to talk to the Duncan Aviation representatives attending NBAA this year, representing several Duncan Aviation services, including airframe and engine services, paint and interior modifications, avionics and parts support and aircraft sales and acquisitions. Don't forget to stop by the by the NARA section of the static display and check out this Embraer Legacy 600 that features a Duncan Aviation 96-month inspection including, full paint and Wi-Fi. Or watch the transformation here on this incredible time-lapse video. During the Opening General Session Duncan Aviation’s own Lee Bowes sang the National Anthem to a standing room only crowd. 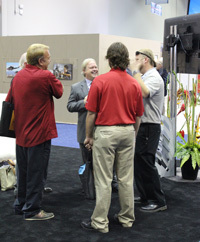 Stop by to see us in booth #208. We’d love to see you. L to R: Duncan Aviation’s John Slieter, Todd Duncan, Universal Avionics COO Paul DeHerrera, winner of the international Top Dealer award, Universal Avionics VP—Sales, Marketing & Support, Dan Reida and President / CEO J.L. (Ted) Neiman. During an in-booth reception today at NBAA, Universal Avionics awarded Duncan Aviation the Top Dealer in North America for the second consecutive year. This award represents the outstanding sales performance of only one North American dealer out of several hundred in its Authorized Dealer network that has achieved outstanding sales performance. 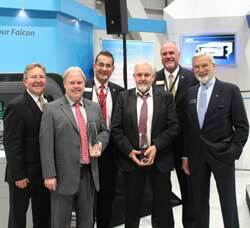 Duncan Aviation’s Chairman was present to accept the award from Universal Avionics President and CEO, Ted Naimer. 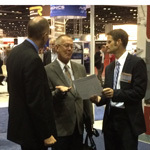 "We are honored to be acknowledged by Universal Avionics. Our companies share the same business ethics and family values. We also share a passion for aviation and they too have a long standing aviation history. The Top Dealer Award highlights the great relationship we share, founded on the principle of working together to provide our mutual customers with leading edge avionics solutions for the business jet market. 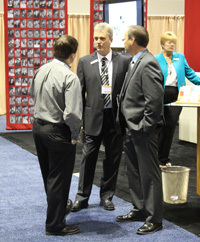 Stop by the Duncan Aviation NBAA booth #C8543 to congratulate Todd and the rest of the Duncan Aviation avionics team. Kaela Paseka is Duncan Aviation’s Graphic Design Lead at its Lincoln, Nebraska, headquarters. She isresponsible for all elements of visual communication, including publication design, industry advertising and companywide branding. She is currently attending NBAA 2013. Her aviation career began 2006. L to R: Bombardier Aerospace Vice President, Aircraft Service Centers, Stan Younger, Duncan Aviation’s John Biever, Aaron Hilkemann, Rod Christensen—Manager Airframe Service and Bombardier’s Director, Authorized Service Facilities, Chris Milligan. 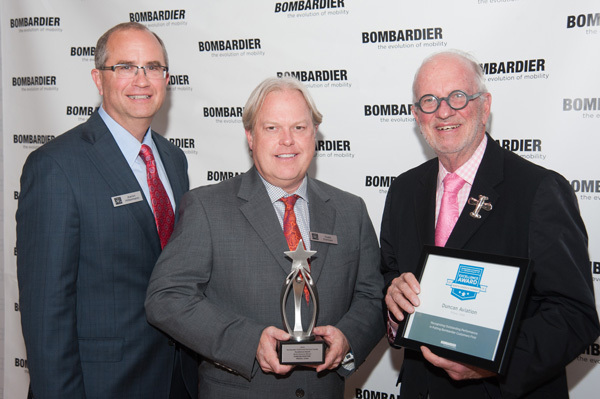 On Wednesday during the National Business Aviation Association (NBAA) Meeting and Convention in Las Vegas, Nevada, Duncan Aviation was again recognized by Bombardier as a top authorized service facility for its support of Bombardier customers. Judged on a set of criteria that included quality, compliance, customer satisfaction and customer influence, Duncan Aviation’s Battle Creek, MI, facility was named the winner of the North America category of the 2013 Bombardier Authorized Service Facility Excellence Awards. Bombardier Aerospace Vice President, Aircraft Service Centers, Stan Younger spoke to the award winners at a private ceremony at NBAA. “It is our ASFs attention to quality and their dedication in providing customers world-class service and support that is being recognized today. Each winner demonstrates a commitment to putting customers first,” said Younger. 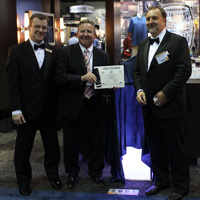 Duncan Aviation President Aaron Hilkemann and John Biever, Vice President Airframe Services in Battle Creek, Michigan, accepted the award from Stan Younger and Chris Milligan, Director, Authorized Service Facilities for Bombardier. 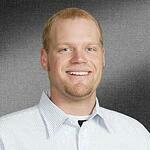 “We enjoy representing Bombardier and their products in supporting of our mutual customers. 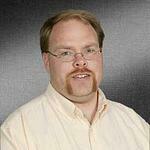 It is a great mutually beneficial partnership that has worked for many years,” says John Biever. 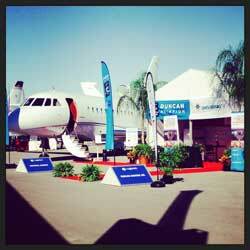 Stop by the Duncan Aviation NBAA booth #C8543 to congratulate Aaron, John and the rest of the Duncan Aviation team. Kaela Paseka is Duncan Aviation's Marketing Graphic Design Lead, and is currently attending NBAA 2013 at Duncan Aviation booth #C8543. She began her career in aviation in 2006. At static on the first day of NBAA, business aviation owners, operators and enthusiasts continually flowed through this Falcon 900B aircraft on display and were impressed by its transformation with a stunning interior and avionics package upgrade. Duncan Aviation representatives are on hand to answer questions and give tours of this beautifully transformed aircraft. Duncan Aviation and Universal Avionics partnered to transform a Dassault Falcon 900B by installing Universal’s EFI-890 glass box cockpit. This cockpit upgrade replaced 25 older instruments, significantly improving reliability and situational awareness, and offers advanced capabilities like WAAS-LPV and FANS 1/A. “If you want an aircraft that’s predictable to operate, properly supported and can hold its value this newly retrofitted aircraft is the way to go,” says Gary Harpster, senior avionics installation sales rep for Duncan Aviation. Additional avionics installed include Rockwell Collin’s Venue Cabin Management System that allows passengers to watch movies on demand on high-definition displays and conduct business, seamlessly. With Collin’s new Skybox cabin sharing, passengers can securely share movies, TV shows and music wirelessly between the on-board Apple iTunes library, Apple iOS devices and the cabin displays. In addition to the avionics installations, Duncan Aviation completed several interior upgrades, including complete soft good refurbishment, new cabinet veneer, Duncan Design Collection PSU overlay panels, EMTEQ LED lighting and much more. You still have time to visit and walk through this Falcon 900B today and Thursday. The aircraft is currently at NBAA static display #140 at the Henderson Executive Airport in Las Vegas, Nevada. Gary Harpster and Duncan Aviation’s Avionics Tech Rep, Chris Christenson, will be on-site for a personal tour and demonstration. 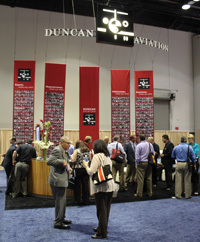 Click here to view more NBAA photos on Duncan Aviation's facebook page. Kaela Paseka is Duncan Aviation’s Graphic Design Lead at its Lincoln, Nebraska, headquarters. She is responsible for all elements of visual communication, including publication design, industry advertising and companywide branding. 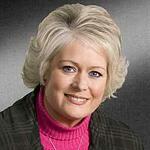 She is currently attending NBAA 2013. Her aviation career began 2006. Right now there are approximately 20 to 25 Falcon 900Bs on the market available for sale. In talking with these owners, I’ve learned the majority of these aircraft were placed up for sale over the concern there was no upgrade path to meet the upcoming mandates and essentially rendering the aircraft as domestic use only. I totally get it. Who wants an aircraft capable of Mach .84 - .87 that can travel 4,600 miles and only be able to fly it in the 48 contiguous states? On the Falcon 900B, the engines, airframe and accessories are still highly supported. Therefore, the weak link in this analysis becomes the avionics. However I am hear to tell you, when it comes to meeting the needs of the mandates for both the U.S and abroad, there is a clear path. With the installation of the Universal EFI-890 solution, a Falcon 900B gains many of the same capabilities of new production aircraft and in some cases, even more. Charts, weather, synthetic vision, electronic engine gauges, camera input, new LED displays, WAAS FMS with LPV and the necessary accuracy to fly in Minimum Navigation Performance Specifications (MNPS) airspace. Want to fly to Europe and fly in the most favorable tracks doing so? 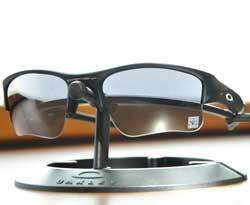 This is the solution. Want to jump up into the airspace over Europe on the bosses schedule and not when air traffic allows you to depart? This is your solution. Add winglets, new custom interior and paint, a state of the art entertainment system and you have yourself one heck of an aircraft that will meet the needs of the future for the next 10 years. Or as an option you could buy a used aircraft with these capabilities for more than seven and a half times what this upgrade would cost you. Keeping in mind that if you wanted the custom paint, interior and entertainment – that would all be additional. On display at NBAA 2013, Falcon 900B with the first EFI-890R cockpit retrofit upgrade, newly designed interior and new CMS. Click to enlarge. Why just read about it when you can come see it. During NBAA at static display #140 on the Henderson Executive Airport in Las Vegas, I personally invite you to walk through and see a Falcon 900B with the first EFI-890R cockpit retrofit upgrade. I will be on-hand to answer any of your questions, as well as representatives from Universal Avionics. Also featured on this aircraft is a newly designed interior, new paint and new cabin/management/entertainment system; all completed by Duncan Aviation. How weak is that link now? 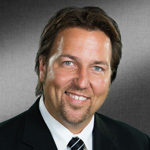 Gary Harpster is a member of Duncan Aviation’s Avionics Installations Sales team and is the current Chair on the AEA Board of Directors. 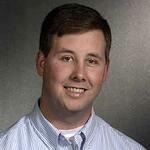 He is an industry expert on the subject of Wide Area Augmentation System (WAAS), co-authoring the Straight Talk About WAAS booklet and Upgrading to WAAS guide, as well as hosting a WAAS video series. His aviation career began in 1997.